The music of our time. Studzinski Recital Hall. Tickets are not required. 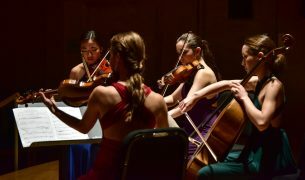 Presented as part of the Bowdoin International Music Festival since 1965, the Charles E. Gamper Festival of Contemporary Music represents a sustained commitment to nurturing and promoting the music of our time. Over its history, the Gamper Festival has celebrated many of the most significant composers such as Milton Babbitt, Luciano Berio, William Bolcom, John Corigliano, George Crumb, and Ralph Shapey as well as new voices at the start of their careers. The Gamper Festival is programmed by Derek Bermel. 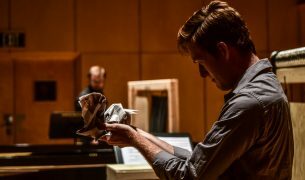 The Charles E. Gamper Festival of Contemporary Music is funded in part by The Aaron Copland Fund for Music, Inc., the Charles Gamper Music Fund of the Maine Community Foundation, and New Music USA.